Perhaps the greatest potential to transform the Midtown Corridor lies with the Greenway itself. There is strong community interest and public commitment to develop the Greenway as a signature green space - a pleasant environment where people can enjoy a more natural setting in the heart of the city. This idea is the fundamental underpinning for all other improvements in the area. 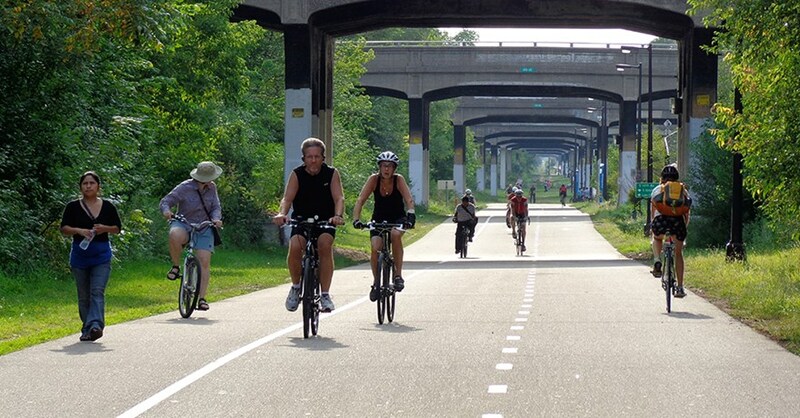 This Greenway renaissance provides a broad range of opportunities for development and, equally important, an excellent mix of recreational activities and regional connections. A tremendous amount of effort and resources have already been expended to make this happen - yet there is so much more to be done! Promote the Greenway as an inviting, safe, and fun place to be. Promote Greening the Greenway as a key initiative in this corridor, providing a wonderful opportunity for partnerships and participation through a variety of planting programs. Several examples of recent successes in this Greening effort include the DNR Metro Greenways grant for the Lake of the Isles area, the donation of trees to the city from the University of Minnesota, and numerous neighborhood based planting plans, clean-up activities, and the Midtown Greenway Coalitions’ Adopt a Greenway Program. Explore, define, and implement numerous public art projects throughout the corridor. This not only adds to the richness and variety of corridor amenities but also celebrates cultural diversity, neighborhood individuality/identity, and our connection to the environment. Safety and security must be primary considerations in and around the Greenway. Allow maximum opportunity for observation when developing the Greenway edge. Policing must be regular and highly visible, with easily identifiable access points. Provide a variety of amenities at Greenway bridges and other locations from which to observe activity in the Greenway (for example, overlooks, sitting areas and other bridgehead improvements). Secure funding for bridge maintenance to enhance pedestrian/bicycle use. Park connection between Lake Calhoun and the Calhoun Commons Village Center along Excelsior Boulevard: This piece of Park Board property could be improved to include a system of walkways linking the just completed recreational trails around the Lake with the proposed streetscape/sidewalk improvements along Excelsior Boulevard. This new park connection could also feature wetland ponds, walls and bridges (similar to the newly constructed wetlands west of Lake Calhoun), picnic shelters, bike racks and storage, new lighting and landscape improvements. Public park at the 5th Avenue / Greenway crossroads: This new park opportunity is located at the mid-point between the Chain of Lakes and Hiawatha Avenue. At this location, it offers a perfect opportunity for destination park, rest stop and also a key at-grade connecting link to surface streets and to attractions along Lake Street and the rest of the corridor. Park space along either side of Hiawatha Avenue as part of the future Greenway overpass: This new park not only announces the Greenway as a key east/west link, but also provides a more gracious connection to the Hiawatha Avenue Transit Station and bikeway corridor. This potential trail head should include a number of rest stop amenities such as rest rooms, drinking fountain, bike racks and bike storage, lighting, and landscape improvements. There are numerous vacant, underutilized or remnant (small, abandoned) properties along the Greenway edge that should be examined for potential park use. The potential to integrate a variety of public green space with new and existing development is also an important opportunity throughout this corridor. These pocket parks, public squares, sitting areas, and other types of public spaces provide the richness, variety (and to some extent) the unique neighborhood identity that characterizes memorable placemaking. There are numerous existing City parks and other public spaces within the corridor that play an important role in the community. The idea of green street connections emerged as a means to tie together many of these already recognized and heavily used park spaces. The character of these ‘green streets’ will be much enhanced by additional lighting, benches and other street furniture, crosswalk markings, traffic calming where possible, traffic signing/signals, and landscape improvements. These key connector streets will provide a network of suggested routes for residents, workers, and visitors to follow that takes best advantage of neighborhood assets. A creative, community-wide system of pedestrian level signage and other way-finding techniques (maps, paving patterns) should be pursued.